we went to a cook-out tonight (our second of the weekend) and i decided to make a pie to take. 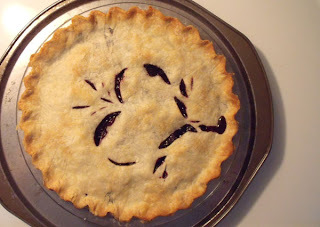 i've been pretty much craving blueberry pie ever since this post, but had momentary thoughts about a peach pie (after cooking peaches the other day for sammy...they smellled soooo goood...). still, blueberry was bound to win. i almost always does. until apple season. as i was working on my filling, i thought about missy and her blueberry picking expedition. and then i thought again about this book, which i must bring with me when we go visiting in october. i think oscar would enjoy the story. i must've been feeling very domestic today. because pie-making was followed by bread-baking. i'm looking forward to a nice slice of sourdough toast for breakfast tomorrow morning. mmmm....i can hardly wait.